Lionette Erica Melton dribbles down court against a Warren County defender during the Cannon County's win over the Lady Pioneers Tuesday at CCHS. For the second time this season, Cannon County's basketball teams have recorded a sweep of neighboring Warren County. In their first action of the new decade, the Lionettes and Lions both won by double-digit margins at CCHS Tuesday night. The Cannon County girls bolted out to a 19-2 advantage at the end of the first quarter and never looked back. The Lionettes lead was 31-14 at the half and was 31 points at the end of the third stanza, 55-24. 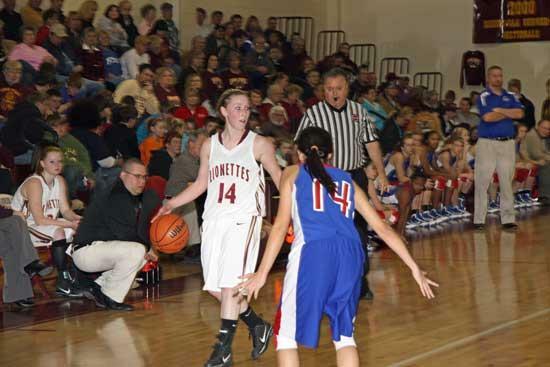 The final tally was 60-43 as Cannon County improved to 14-0 on the season. SCORING: Emily Sissom 18 points; Erica Melton 9; Ashley Campbell 7; Lindsey Reed 6; Chelsey Payne 6; Taylor King 5; Abby Jakes 4; Lauren Ruehlen 3; JoAnna Young 2. The boys' battle was a little closer at the beginning as the Pioneers grabbed an 11-9 lead at the end of the opening period. The Lions turned up the defensive heat in the second quarter to take a 24-15 advantage at intermission. Cannon County scored as many points in the third quarter (24) as it did in the entire first half to take a commanding 48-23 lead, and then coasted to a 61-40 triumph. The Lions improved their record to 10-4. SCORING: Jared Nave 14 points; T.J. Mitchell 9; Colin Jones 8; Justin Davenport 7; Andrew Woodin 6; Brian Cripps 6; Brad Hutchins 4; Cody Ruehlen 3; Jarrett Melton 2; Justin Tobin 2. Cannon County's teams will be in action at home again this coming Friday night, facing district rival Upperman.